No visit to New York is complete without a few galleries and museums, so we started our stay with a stroll through Central Park to the Guggenheim. You can check out the Guati Movement, a Japanese art movement following WW II through the ‘50s and ‘60s. Although my favourites this visit were a huge Bollywood-like ‘visit to Pakistan’ painting by Navin Rawanchaikul from Thailand. The hat kicking Indian soldiers I saw at the border on my trip to Pakistan last year featured. Then there was the Dang Vo selection from Martin Wong’s amazing collection of bric a brac, nick nacks and general memorabilia. Wonderful! A few doors along Museum Mile I also popped into the Neue Gallerie to check the Klimts – a couple of years ago there was a big Klimt exhibition at the Tate Liverpool in England. The Neue Gallerie had a very strange security requirement – you could not bring any bottled water into the museum. Once you’d crossed the threshold you couldn’t bring your bag any further either. But the bags checked into their storage facility were not allowed to contain water bottles. Why? No idea. 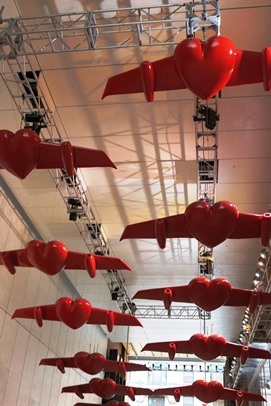 ◄ You don’t have to go to galleries to find New York art, just east off Times Square between 42nd and 43rd Sts is this delightful formation of flying hearts – it’s ‘Goodbye My Love’ by Esterio Segura from Cuba.